House dust mites are microscopic bugs that primarily live on dead skin cells that are regularly shed from humans and their animal pets. Just thinking of these dust mites living in your pillow by the millions, eating your dead skin and hair is enough to make you sick (literally and figuratively). The are a major cause of asthma and allergies; especially in vulnerable individuals, such as children and the elderly. In the spring, pollen aggravates allergies, and dust mite infestations make it worse. The Summer and Winter months are a particular problem, as we close up our houses and the concentrations of dust mites and their faeces increases inside. And dust mites are at their multiplying peak during warm, wet weather. Dust mites are generally harmless to most people. They don’t carry diseases, but they can cause allergic reactions in asthmatics and others who are allergic to their faeces. People sometimes confuse dust mites with bed bugs. Skin cells and scales, commonly called dander, are often concentrated in lounging areas, mattresses, frequently used furniture and associated carpeted areas, often harbour large numbers of these microscopic mites. Since the average human sloughs off 1/3 ounce (10 grams) of dead skin a week. That gives dust mites a lot to eat. Cats and dogs create far more dander for dust mites to eat. 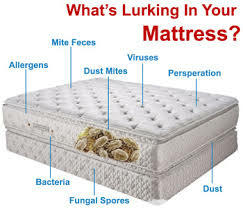 A typical mattress can contain tens of thousands of dust mites. Sick yet? Nearly 100,000 mites can live in one square yard of carpet. Ready to convince your spouse to start bathing regularly? Did you know a single dust mite produces about 20 waste droppings each day, each containing a protein to which many people are allergic. The proteins in that combination of faeces and shed skin are what cause allergic reactions in humans. Depending on the person and exposure, reactions can range from itchy eyes to asthma attacks. And finally, unlike other types of mites, house dust mites are not parasites, since they only eat dead tissue. Gross, but true. 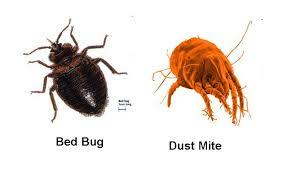 At The Green Way Pest Control we use more than one process to get rid of Dust Mites and Bed Bugs.